﻿Published by Sareth Ney on July 6, 2016 at 2:14 a.m.
JACKSONVILLE, Fla. – Comedy Zone – Jacksonville’s stage will be set for five showcases featuring Arnez J, from Aug. 7 through Aug. 9. The number of performance, dates and times are: one on Aug. 7 (7:30 p.m.), two on Aug. 8 (7:30 p.m. and 9:45 p.m.) and Aug. 9 (7:30 p.m. and 9:45 p.m.). He is an actor, writer and stand-up comedian. Hailing from Atlanta—Arnez J began working at the age of14 at a gas station, after he lied about his age. While he worked, he attended school and had dreams of becoming a professional baseball player. While working as a flight attendant, he incorporated comedy into his profession. With the laughter by the passengers and the crew on the planes, his friends urged him to give stand-up comedy a try. He departed from the airline industry and pursued comedy. With a background in sports and the ability to entertain onlookers, Arnez J was recruited by talent seekers on behalf of the Harlem Globetrotters. After months with the basketball team, he was sidelined with a knee injury and fully committed himself to comedy. With Arnez J’s full commitment, he generated buzz for himself on a local level was dubbed as one of “Hotlanta’s” funniest newcomers. He entered the “Bay Area Black Comedy Competition” and became a finalist. He made his television debut on Showtime’s “Comedy Club Network”. 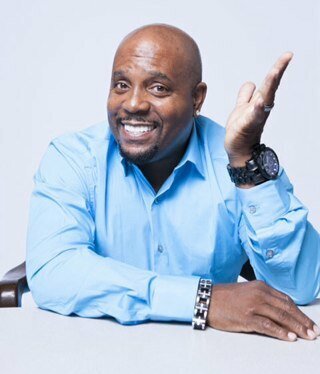 More television works were presented to Arnez J and he made appearances on: BET’s “Comic View Grandstand Hour Special”, Comedy Central’s “Make Me Laugh”, “Louie Anderson’s Comedy Showcase”, NBC’s “Friday Night Videos”, “The Keenan Ivory Wayans Show” and “The Mo’Nique Show”. Credits in which Arnez J portrayed himself include: “Showtime Comedy Club Network”, Russell Simmons’ “Def Comedy Jam”, BET’s “Comicview”, “Comedy Central Presents: Arnez J”, “Shaquille O’Neal presents All Star Comedy Jam: Live from South Beach”, “Comics Unleashed”, “Arnez J: Racially Motivated” and “Upload with Shaquille O’Neal”. Writing credits for Arnez J consists of “Def Comedy Jam” and “Comedy Central Presents”. He has three credits in the following films: “The Maintenance Man”, “Up Against The Wall” and “Plenty”. He was uncredited for “Friends and Lovers”. Currently—Arnez J’s comedy special, “Arnez J: Racially Motivated” can be streamed on Netflix. He can be followed on Twitter at @arnezjcomedy. Ticket prices for his shows at Comedy Zone – Jacksonville are: $25 (Aug. 7) and $30 (Aug. 8 and Aug. 9). The prices exclude taxes and service fees.